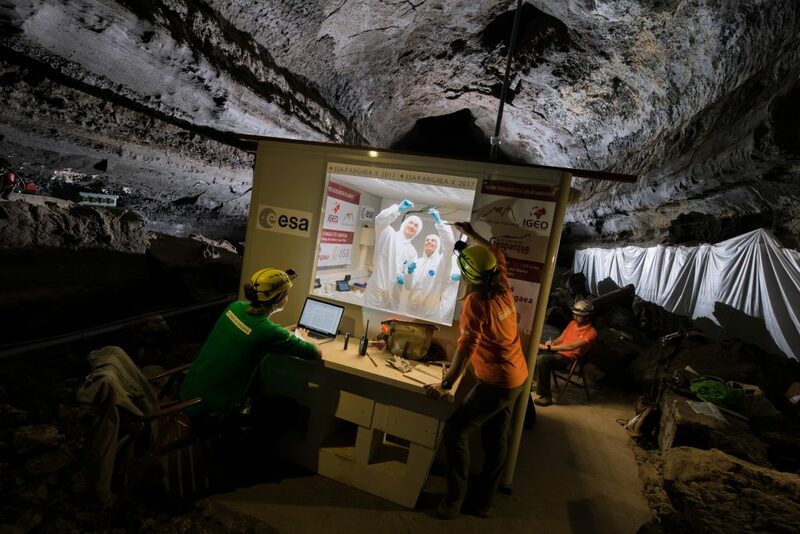 A team of microbiologists, engineers and an astronaut partnered up during the latest Pangaea-X campaign to look for Mars-like life in a lava tube, and found more than 10 species – assisted by a smartphone. The results show how the barren landscapes of the volcanic island of Lanzarote, Spain, harbour microorganisms that can thrive underground in high concentrations of salt. The volcanic features and tunnels created by flowing lava – called lava tubes – on the island are a perfect setting to test new approaches to planetary science. 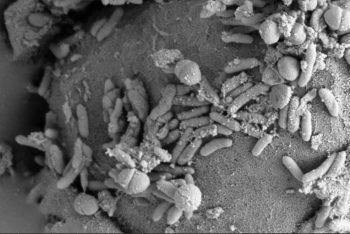 The microbes found in volcanic rocks raises the hope of finding life under the surface of Mars. The international team on the Pangaea-X expedition ventured into La Cueva de los Verdes, one of the biggest lava caves by volume known on Earth in November 2017. With a length of 8 km and sections 30 m in diameter, this cave is part of the Corona lava tube. “It is one of the most promising candidates to help us understand microbial processes under the surface of Mars,” says Ana Zelia Miller, a microbiologist at the Institute of Natural Resources and Agrobiology of Seville in Spain. From the Galápagos Islands in Ecuador to the Canary Islands in Spain, Ana has travelled the world studying the diversity of bacteria in isolated environments. She discovered new types of bacteria and learned that they can use minerals as source of energy to grow. 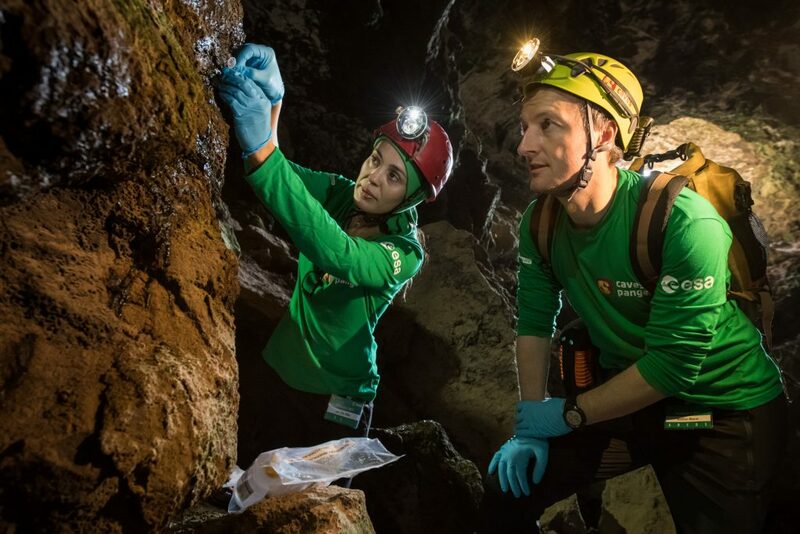 Matthias learned how to collect samples, avoid contamination and perform DNA analysis – all while inside the cave. The astronaut had to look for promising places to search for traces of life, and used portable instruments for DNA sequencing from NASA’s Johnson Space Center. The DNA sequencing took place in a laboratory inside the lava tube. 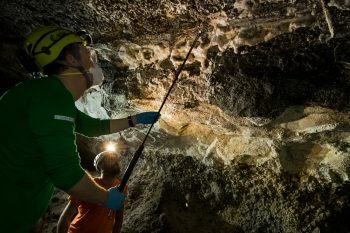 It is the first time ever that the DNA of microorganisms living in a lava tube has been sequenced without the need of taking the sample to the surface. 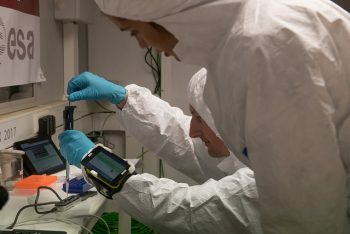 The team used a third generation sequencing device with reduced dimensions, developed by Oxford Nanopore Technology and already used on the International Space Station for microbiological analysis. 24 hours after sample collection, the preliminary results showed that there is plenty of life in this ecosystem. The team obtained nearly 9000 DNA samples from over 10 species of bacteria. “Most of the samples were from halophiles, organisms that have adapted to handle high salt concentrations, over five times more than the concentration of salt in the oceans,” explains Ana. “Understanding and identifying these microorganisms could help us recognise volcanic niches that might host life on other planets,” she adds. 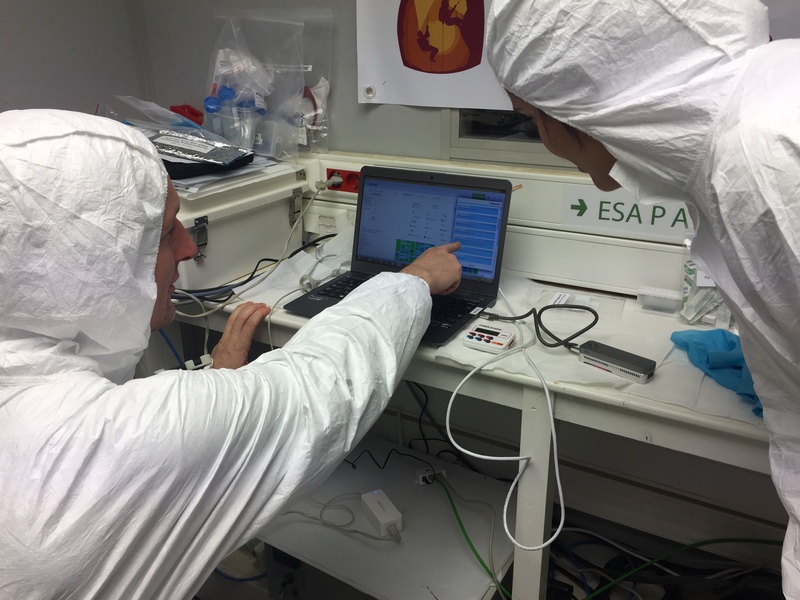 Matthias used ESA’s mobiPV system, or mobile Procedure Viewer to display step-by-step procedures for the DNA sequencing. MobiPV was designed to support astronauts on board the International Space Station. The wearable system allows the crew to access and execute science experiment procedures on-the-go instead of being on a traditional laptop at a fixed location. “We were looking for mobility. We used it for the first time to support real operations in Lanzarote. Pangaea-X allowed us to move from technical development to real operations,” says Mikael Wolff, ESA project manager since 2012. This exciting engineering experience is the result of close collaboration with the European Astronaut Centre – all the way from user experience workshops and app development to qualifying hardware, usability reviews and end-to-end testing. With mobiPV Matthias could view the procedures hands free on a smartphone attached to his wrist by a 3D-printed holder. “The device made operations easier for the astronaut, who relied on the smartphone to read instructions, and a tablet to look at images,” explains ESA lead engineer David Martínez. Matthias was already familiar with DNA sequencing and the mobiPV prototype when he used it during NEEMO (NASA Extreme Environment Mission Operations), an underwater mission for astronauts to simulate spacewalks. The software was improved following a test during Matthias’ aquatic venture in 2016. While a new version of mobiPV is being sent to the Space Station for the crew to use, Mikael sees the potential for missions beyond low Earth orbit. “The Pangaea-X campaign opens the door to more collaborative work in space, and help us to tune the technology we need for planetary exploration,” adds Mikael. The latest version supports teamwork also on our planet. “The features upgraded in mobiPV can be used for complex maintenance activities here on Earth. Experts and technicians can work together even if they are located continents apart,” explains Mikael.